Life returned to the racecourse on a day NYRA hung a skeleton in the grandstand and parked a hearse out in front. The Abby Todd Dancers of Albany, NY performed “Thriller” between races. Their dance began with a pile of humans pretending they were dead. Children wore costumes as if it was Halloween. It was pretend Halloween. Aren’t they all? 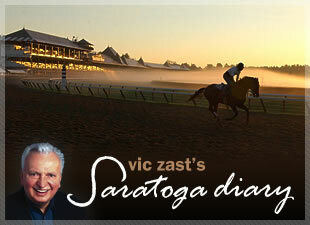 Five days of racing remain for the Spa course this summer. Wednesday began a good run. Multiple stakes races are pegged for each card from here on. Two went into the record books today. They were minor, unless you won them. 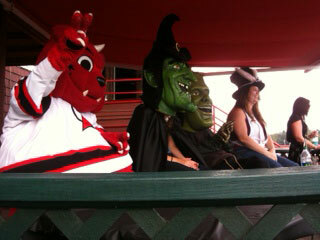 Caption: NYRA stewards (or Halloween costume placing judges) at work. Only five horses ran in the $75,000 Lady Tak Stakes. Trainer Chad Brown – that man again – saddled Kid Kate to victory. Eddie Castro was aboard for his first of three winners. Castro rode Count Catamount, the winner of the sixth race, and Alaura Michele, the winner of the eighth. The eighth was the $75,000 P.G. Johnson Stakes, meaning Castro was aboard two stakes winners Wednesday. By the way, don’t think that the jockey race is between John Velazquez and Javier Castellano only. By taking the day’s final race aboard Howie and the Cat, Castellano is now tied with Velazquez at 46 winners apiece. But Ramon Dominguez is only seven winners back. Dominguez urged Hammock to better Scorper by a neck in the first race. The two horses ran dead even for the last half of the one-mile grass event. Dominguez then sat aboard Risky Rachel as she overwhelmed her competition by over 10 lengths in the ninth. Velazquez finished second three times. Velazquez seemed to have his best opportunity to win in the seventh race. He was aboard the 2-5 favorite Mr. Style. Officer Prado ridden by Corey Nakatani engaged Mr. Style early and outlasted him to the wire. Losing in his lone start to J P’s Gusto - a record-breaking colt that’s going to be the gr. 1 Hopeful Stakes favorite - convinced the public that Velazquez’s mount was destined to win. He didn’t. An officer not named Prado arrested Kent Desormeaux for trying to hit a NYRA security guard with his car. The Hall of Fame jockey is to appear in City Court to face a misdemeanor charge Thursday morning. Thursday afternoon’s main charge is the gr. 2, $150,000, 1-1/16 miles With Anticipation Stakes on the Mellon turf course. Three lucky patrons will have their names drawn in a sweepstakes and be given a $1000 win wager. Veterans of our Armed Forces will be admitted free. Havre de Grace is in the house. Caption: Two dozen Michael Jacksons perform Thriller.